Ekhai Pu Sandman, HAPPY B'DAY em em. I wish you all the best and may God bless! hmm i wish ho ee. 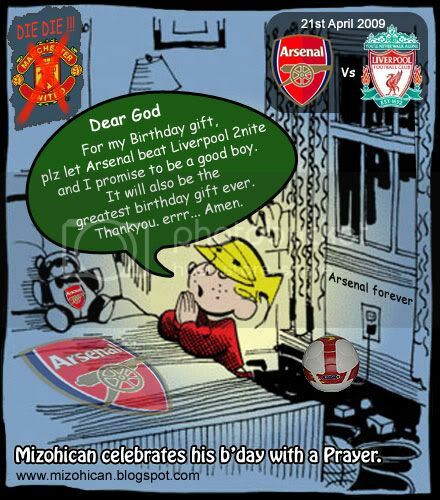 Please make Arsenal win the Champions League te ti zawk la. :). ka wish tawh tho che sia phone ah. Repeat tawh lo mai ang auh! Happy birthday. May the fleas of a thousand camels infest the crotch of your enemies and may their arms be too short to scratch it. Happy Birthday! Hope you are doing something (or someone!!) fabulous to celebrate. How did you celebrate? and how right is Grail?!! Ve tops.. Happy B'day auh. @ Zaia: hehehe thank you hotupa. Zanin chu, nia, i no. keipawn ka hre chak :-) Ade, RVP, Almunia, entire defense, etc etc an tel dawn lova, mahse kan chak thovang. hehehe. @ Tony Lianhna: Thank you thank you Pu Tony. Thank you dear Nancy... comment ka reply lai in chiahin i lo comment hman a ni maw. i va dek chukchu ve. lolz. Just kidding. Thanx for the wonderful wish once again!! Happy B'day once again! nizan U Jim a tang top ania ..sms te thon kual vel lolz! Happy Birthday dear Pu Sandman, and let your prayer be answered 'coz we're in a same side. Zhu Ni Sheng Ri Kuai Le! As for your wish I join you in rooting for arse this time, but five bucks and everything else say Liverpool will prevail tonight. 2-1! sorry about that. @ incognito: Yeah yeah, its no rocket science that Liverpool are the better team tonight, with RVP, Ade, the entire main defense squad and the Goal Keeper all out injured. But Arse are infamous for shooting down giants and causing upsets :) Thanx for the b'day wish bro. I Piancham lo thleng chu khuanu hian malsawmin veng zel che rawh sen.
Zanin chu kha EPL ah chuan eng maw i han predict a? Penblwyd Hapus hotupa! It's hopeful that your prayer will be answered... It's halftime now. Liverpool 0-1 Arsenal. So far so good! BDay Card chu nalh kher mai mahse i tt hlawhtling teuh hle mai!! Arsenal 4 Liverpool 4 tho. An chak emaw chak lo emaw ka match enah chuan la hmuhnawm bermai Liverpool ka lo tan zawk hret nen. (Belated)Happy Birthday gain!Please mail me your postal address - home or office, whatever. I want to send you a compliment copy of my newly out book. Hope your birthday was filled with the things you love and the music you adore, coz god knows you don’t get enough of that. Happy freakin belated Burfday! Here's to lots of fun for the rest of the year. Muah! Ka net connection a tha lova...sowee i'm late...happy belated b'day!! @ Marzie: Thank you so much for the lovely wish, dear. And I think both B and I didn't get what we wanted. lolzzzzz. Anyway, it was an amazingggg match! @ Vaiva: hehehe... a nuam ve reuh lutuk, Mapuia (Vashi) ST-a leh ST-i, etc an rawn kal a, match kan en ho vek a... :D Hmuh nawm khawp mai. @ Jinx: eee hotunu, hetah pawh min rawn wish nawn leh a, i va ti lawm awm tiah tiah ve :-) Thanx once again. @ Faka: hehehe... Half time 1-0 a lead tawh kha chuan kan lo phur ve hman a sin. Mahse, a chang hi chuan kan Pathian hian fiamthu angreng ve deuh te hian min han bawl ve thin a, score 4-4 a rawn ni ta a nih kha. Mahse a ropui tho tho tiang ang match hmuhnawm lutuk te min pe thei hi. @ Anonymous: eee hmuhnawm tak a ni!!!! Ka thiante Arsenal leh Liverpool tan te pawh tumah kan la na lo, match kha a hmuhnawm bawk e ni. @ Mesjay: Mailing you my address right away. Dying to read your new book!!! Thanx for the wish brother. Chuan, ni e, ka dilna rawn thleng lo mahse a pawi miah lo. A bawn eeee ni. A very Belated Happy Bday, dude..
Belated Happy B'Day. Many Happy returns of the day!! I was travelling, so could not access internet for sometimes. Chp 238. Monday morning, where’s the Blues?